Overtime, even sturdy structures are susceptible to the weathering effects of wind and rain. Masonry chimneys are no exception, and they are being worn down on a daily basis by precipitation and weathering. As they stand outside and endure the elements day by day, it’s hard to not see break and crumbling. However, the team at Jiminy Chimney Masonry & Repair has the skills and experience to help repair your masonry chimney. It is very easy to check out the state of your mortar once the snow melts. 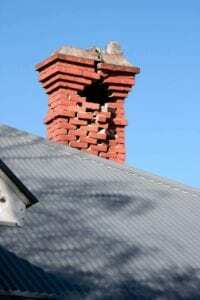 Just take a walk outside and look at the base of your chimney. Are there white flakes or specks littering the ground? This is a condition called spalling, and it’s a sign that your mortar is in a weakened state. Another way to check this out is to touch the mortar. If it’s soft and crumbly, then chances are your mortar needs to be replaced. If this is the case, it’s very likely that we’ll recommend tuckpointing. Tuckpointing is the process of removing the old, weakened mortar and replacing it with new, reinforced bricks that are stronger. This may sound like a quick and easy process, but in truth, it’s a job for trained professionals who have the proper tools and skills. If you live in Chicago or the Chicagoland area, then the company to call is Jiminy Chimney Masonry and Repair. You may be wondering what makes Jiminy Chimney Masonry and Repair the best chimney place to call for tuckpointing, chimney inspection or repairs. First, take a look at our credentials and certifications. We only hire Chimney Safety Institute of America (CSIA) certified sweeps, as this is the most respected and nationally recognized program in the industry. We have an A+ rating from the Better Business Bureau, which is recognized for our outstanding service. We’ve been in the business for over 30 years, keeping our customers in and around Chicago safe and satisfied. So if you think your mortar is in need of replacing, need a chimney inspection or cleaning, suspect there’s been a chimney fire, or looking for tuckpointing, then you should call Jiminy Chimney right away. We’ll make sure to get rid of all creosote buildup and other blockages. We can also take care of any repair work. If you’re looking at updating your fireplace, we can handle that, too! Give us a call today to schedule an appointment with the professionals at Jiminy Chimney!